Known as the Maglev (magnetic levitation) train, China's flagship transport system takes eight minutes to hurtle the 30 kilometres from Shanghai airport to the city's outskirts -- a journey which takes up to an hour by car. A magnetic charge lifts the train's sleek white carriages, first of their kind in the world, one centimetre above the track. British Prime Minister Tony Blair has held a seminar to consider building a Maglev route along the spine of Britain through Birmingham, Manchester, Leeds, Newcastle and Edinburgh.The project would pay huge environmental dividends making domestic air travel virtually obsolete. Finance minister, Gordon Brown, rode Shanghai's Maglev in February. The German company behind Shanghai's Maglev, Transrapid International, has spent 18 months on a "pre-feasibility" plan which reckons on a basic cost of GBP20 million (US$37 million) a kilometre. The entire 800-km route would cost GBP16 billion (about US$29 billion) even before taking into account land purchase. Jochen Kruse, Transrapid's project manager in Shanghai, said: "We've had discussions with Mr Blair's office -- now we'll be going to the Department for Transport." He said Britain's hilly terrain was ideal for the Maglev, which can be angled at a gradient of up to 10 per cent. The Shanghai system has been open for 18 months and has carried more than 2 million people. But critics question the durability of the technology -- one of the two tracks has been shut for long periods while engineers adjust cables which spark the train's magnetism. Furthermore, the entire system is sinking into the Pudong, Shanghai's marshy outpost of land used as an economic boom zone. The Chinese Government is considering an extension into the city and possibly to the neighbouring city of Hangzhou in time for Shanghai's hosting of the World Expo in 2010. 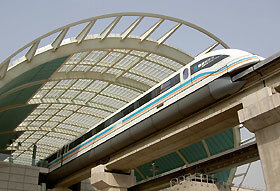 The Maglev is attracting followers around the world: Germany wants one for an airport link in Munich. The US Government is to choose between three Maglev schemes: a Baltimore to Washington railway, an airport link in Pittsburgh or a 50km track through the Nevada desert linking Las Vegas with casinos on the Californian border, which could be extended to Los Angeles. Mr Kruse said a green light from Mr Blair would enable Transrapid to come up with a detailed scheme in 18 months. But construction could take many years: "How long does it typically take to build such things in England? If you could import a thousand Chinese workers, it could be built in a year."